Dentures and bridges were long considered the best treatments for missing or failing teeth. Today, though, you have another option. Dental implants have rapidly become the gold standard, and for good reason. One dental implant can support one crown, while implant supported dentures and fixed implant bridges need just a few dental implants to support a full arch of high-quality, strong, and stable replacement teeth. The process of placing dental implants is the same regardless of exactly which procedure you choose. The first step is a thorough examination to ensure that dental implants are the best choice for you. Using X-rays and 3D scans, we learn the current condition of your mouth and then work with you to develop a treatment plan. Please note that any existing dental issues such as gum disease or decay must be addressed before dental implant treatment can begin. Once your existing dental problems are treated, any teeth that need removal are extracted. This relatively minor procedure can be performed under local anesthesia or while you are safely sedated in our office. Although it is normal to feel a bit sore for the next few days, many patients report that they feel much better overall once the bad teeth are gone. Temporary teeth will be made, so that you are not without teeth while you heal. Successful dental implants, depend upon having enough strong healthy jawbone. When planning for dental implants, it’s important that your existing jawbone is maintained. Bone grafting is performed to help ensure there is enough bone for a dental implant to be placed and that can be maintained for decades. This is a simple procedure, but we will need to wait a few weeks for it to “take” before we proceed. Dental implant placement is a minor oral surgery procedure. After thoroughly numbing your mouth, we will cut a small flap in your gum tissue. We will then use a series of drills to create a tiny opening in your jawbone. We will screw in the implant and then stitch the gum tissue back together. 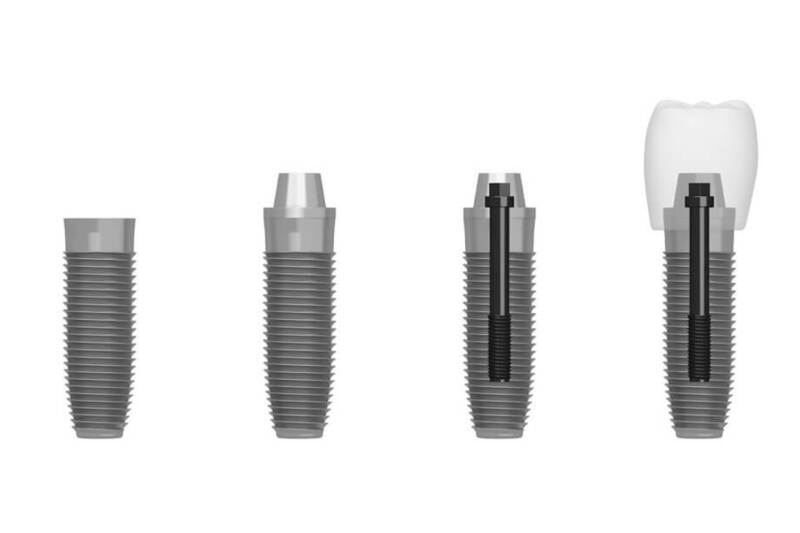 Dental implants are topped with either a cover screw or a healing cap. A cover screw is flat, while a healing cap is shaped so that it comes through the gum tissue. You will continue to wear your temporary teeth for several weeks while your mouth heals. Please note, that we can place multiple implants during a single surgery. When your implant is fused with your jawbone, you will return to our office. In a quick, minor procedure, we will replace the cover screw with a healing cap. At this point you are ready for your dentist to create an abutment and the final restoration. All-on-Four is a unique option that allows us to secure a full arch of fixed teeth on just four dental implants. The implants are considered immediate-load, which means that you will receive fixed teeth on the same day as your implant surgery. In a few months, you will have a final fixed bridge fabricated. This restoration is much stronger and looks even more natural than the immediate bridge placed after your surgery. If you are ready to start your dental implant process with a skilled, compassionate oral surgeon that you can trust, contact Hoboken Oral Surgery today at 201-659-6999 to schedule a consultation.